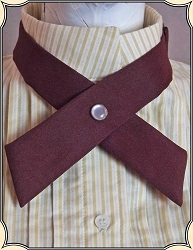 This Ladies Ribbon tie is made of nylon with an adjustable strap and pearlized snap at the neck front. 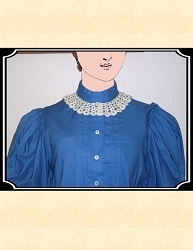 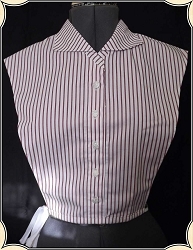 Our elegant fancy collar will instantly change the looks of any of your Victorian outfits. 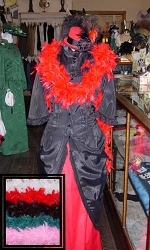 These truly Victorian style Chemisettes will fill in and dress up your Walking Jacket or Gored Peplum nicely. 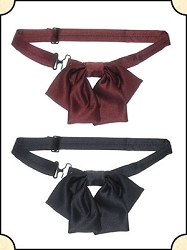 Worn with our Ladies Shirtwaist and Skirt to complete your look, this bow tie has an adjustable neck band with authentic hook. 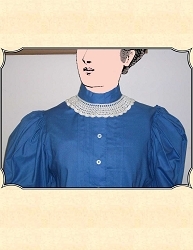 With buttons and lace down the front and a stand-up collar, this cute and useful Victorian accessory will replace a bulky or warm blouse and will give an old outfit a new look. 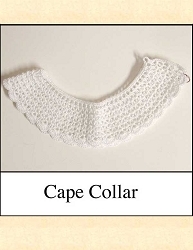 Dainty scalloped hand crocheted ladies collar is perfect for dressing up that tired old dress or blouse. 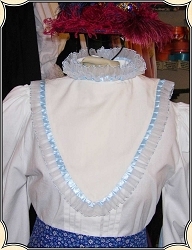 Large Ladies Hand-crocheted cotton collar in a Victorian pattern, measures 4 1/2" from top to bottom edges. 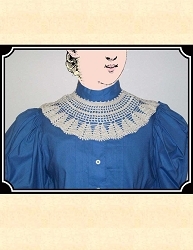 Ladies Hand-crocheted cotton Victorian collar in a small shell and post pattern, measures 1 3/4" from top edge to bottom of scallop. 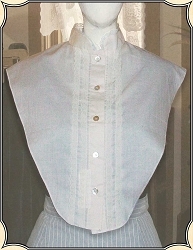 Hand-crocheted Ladies Cotton Victorian Collar in a cape pattern, measuring 2 3/4" from top edge to bottom of tiny scallop. 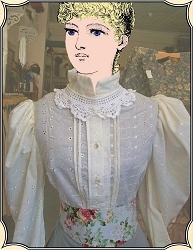 Dress up your blouse or dress with a hand crocheted collar and be the talk of the Church Social.